In his family’s four decades of farming vineyards on Sonoma Mountain, Chris Benziger of Benziger Family Winery says he’s never experienced weather like this year. It’s just after 10 o’clock in the morning, and the Benziger crush pad is humming. Huge white bins of dark, dense clusters of grapes zoom by on forklifts, a sorting machine sputters and spits out unwanted stems, and the uniformly sized fruit tumbles out layer upon layer into a waiting vat. But — perhaps more than ever before — their journey to the winery this year has been difficult. "The intensity and duration of our heat spikes was unprecedented. We’ve never seen anything like that before, so it really was a challenging harvest," says Benziger, trying to speak up over the buzz of machines. "We're seeing hotter periods, longer heat spikes, less rain, and then when it does rain, a lot of rain at once." Climate extremes and record-breaking temperatures in Napa and Sonoma valleys have put vintners to the test this year. At Benziger Family Winery, the estate vineyards suffered from 12 days of temperatures above 100 degrees and spikes beyond 115 degrees this summer, the hottest many here can remember. Some vineyards suffered heat spikes beyond 115 degrees, the hottest many can remember. All that heat takes its toll on the growing grapes, shutting down most vines at a pivotal stage as they try to just stay alive. "What we’re really worried about is 'raisining,' because raisins are little sugar bombs and they can really mess with the vintage of a wine," explains Benziger. He estimates that the winery will lose about 10 percent of its harvest as a result of grapes that couldn’t take the heat, dehydrated, and shriveled up. It's a similar story for many across Sonoma and Napa valleys. At Hudson Vineyards in Carneros, Lee Hudson grows 200 acres and 17 varieties of grapes. Like many vineyards here, Hudson and his crew harvest at night to keep the grapes cool — sweeping through row after row and slicing clusters from the vine into bins before heaving them over into a moving tractor. "For the first 18 days of harvest, we basically worked straight 18 days — as many as 10 hours a day. So it was exhausting," says Hudson, walking his vineyard in a cowboy hat. "We had nine straight days of over a hundred degrees. And that required that we get the grapes off the vine before they got too sweet," explained Hudson, crunching crisped brown leaves underfoot as he walks between vineyard rows. They sprinted to pick their prized chardonnay when a Labor Day weekend heat spike threatened to dehydrate the fruit. Hudson measures the turgor pressure — basically the water content — of the leaves to determine how much to irrigate before heat spikes hit. But Hudson estimates he will still have lost 10 percent of his crop to the heat. At Crocker and Starr Winery in St. Helena, winemaker Pam Starr crouches down beside her vines, peering underneath clusters and lopping off those that didn’t survive the heat. "That won't make it into the tank," she says, cutting one cluster with pruning shears. "We always hope that our weather predictors can be predict the weather; I was hoping they’d be wrong this time," says Starr, who has been making wine for 34 years. This year, she estimates they’ve lost 15 percent of their 3,500 case production — including about half of her most prized block of grapes. “It affects us in a very large way with a very small — boutique volume,” says Starr. "This year we’re going to really put our winemakers’ hats on. And with the lower crop weight, the berries have less juice. And so with less juice we have to sort of change up what we’re gonna do in the winery," says Starr, nonetheless keeping her bright smile. They pruned back their grapes' canopy — the protective leaves growing around grape clusters — much less this year in hopes of shielding them from the sun. "We were on patrol every day, walking the vines," says Starr. "Asking ourselves, you know, what could we do? And that which we could do, we did. And that which we couldn’t do — which was to control the weather — we just sat by and watched." Back at Benziger, an optical sorter uses lasers to identify raisined or dehydrated grapes from perfectly plump ones. "The good news is we'll have a high-quality vintage." 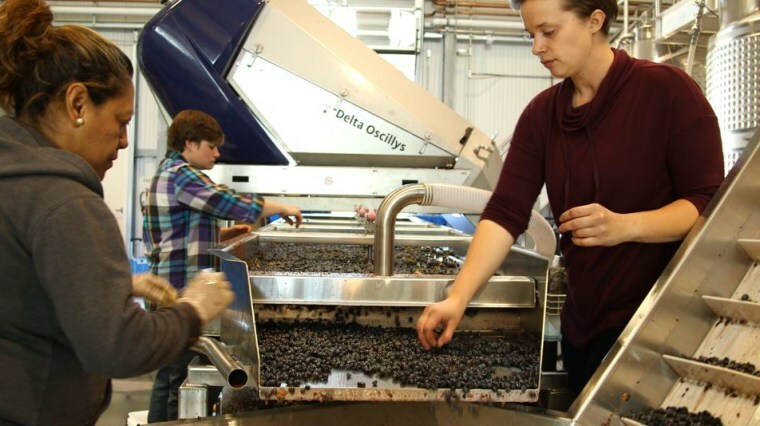 "This thing has really saved our skin this year," says Benziger, gesturing as the machine removes stems from grape clusters, separates the grapes, and shakes out any unwanted leaves or debris. "Only the best grapes go in right here. These things are perfect berries now, and this will guarantee that we have a great vintage." He’s willing to lose the lower-quality fruit to ensure what does make it into the barrel is the best of his vineyards. "The good news is we'll have a high-quality vintage. And that's more important for us," says Benziger. Since most wineries expect the unexpected and plan ahead for losses like these, consumers shouldn’t expect to pay more for a bottle of wine despite the challenge for winery owners. Lee Hudson is optimistic about this year’s surviving fruit, but can’t be too sure of the heat's true impacts. "We need to wait until the spring, when we have finished wines and we look at 'em," says a cool, calm Hudson, flanked by his dogs. "I think that it’s too early to really to determine what the outcome’s going to be." Chiara Sottile is a producer and reporter covering business and technology for NBC News.